That’s because old friend Paul Tanaka won the race even though he didn’t actively campaign for re-election. His margin of victory left no doubt about what the voters in Gardena think about the job that Paul has done for the city during his past two terms. I doubt if any other candidate for office would register such a one-sided victory when not actively seeking the office. Well, Gardena will be in good hands for another term with Paul at the helm. Paul is a great friend of my son Paul. They graduated from Gardena High together and I’ve known him since he was a toddler. Paul is the undersheriff with the L.A. County Sheriff’s Department, the highest-ranking position under Sheriff Lee Baca. And now, mayor for his third term. As a 58-year resident of Gardena, I sure can’t ask for more than to have him as the leader of our great city. 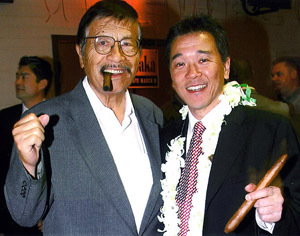 An old friend and follower of my column, Herb Murayama, sent a photo that I don’t ever recall having been taken. 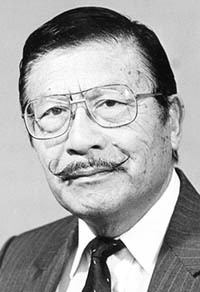 I thought it would be kind of timely to publish it because it contains the photo of renowned Nisei George Aratani, who passed away last month. 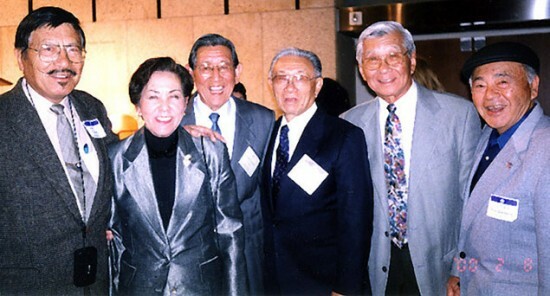 What makes the photo unique is that the late Cappy Harada and Wally Yonamine are in the photo. Both passed away not too long ago. Cappy was heavily involved in baseball both here in the U.S. and in Japan. Here in the U.S. he was an executive for the San Francisco Giants and held a similar position in Japan with a pro club over there. Of course, I don’t have to write about Wally’s career in baseball. He was the first American (and Nisei) to play in the Japanese pro league with the Yomiuri Giants. However, I met Wally not through his baseball career. He played pro football with the San Francisco 49ers and that’s when I first met him as I interviewed him about his gridiron career before he advanced his athletic career as a baseball player. Also in the photo are Sakaye (widow of Aratani) and on the far right, Herb, who sent me the photo. Thanks, Herb. The photo will add much to my collection. “My name is Steven Tani, a 58-year-old Sansei from Boyle Heights and a Roosevelt High School graduate. I’ve been a huge fan of your column for many years. I’m sure many readers have told you that you should write a book containing all the funny jokes and stories that have appeared in your column over the years. Yes, I would be honored to have what I write published. You have my permission to do so. Thanks a million. I’ll follow up with another letter from reader Ray Kawaguchi. Its contents may be a bit timely because we all read in the media about car owners having their vehicles broken into not to steal the car but the contents, which may include valuable information about the owner. “A friend recently left his car in a long-term parking lot in San Jose. Someone broke into the car. Using the information on the car’s registration in the glove compartment, they drove the car to the owner’s home in Pebble Beach and robbed it. So, I guess if we are going to leave our car in long-term parking, we should not leave registration/insurance in it, nor your remote garage door opener. This gives us something to think about with all our new electronic technology. “A couple of weeks ago, a friend told me that someone she knew had their car broken into while they were at a football game. Their car was parked on the green that was adjacent to the football stadium and specially allotted to the fans. Things stolen from the car included a garage door remote control and a GPS that had been prominently mounted on the dashboard. “When the victims got home they found that their home had been ransacked and just about anything worth anything was stolen. The thieves had used the GPS to guide them to their house. They then used the garage remote to open the garage door and gain entry to their house. The thieves knew the owners were at the game and knew what time the game was scheduled to finish and so they knew how much time they had to clean out the house. It would appear that they had brought a truck to empty the house of its contents. I learned quite a bit from this message from Ray. Hope it helps a lot of you readers out there in readerland. I’ve changed a lot of things I used to leave in my car and I hope I don’t face the same tragedy that the folks in the foregoing did. Of all the foreign countries I have visited over the years, the one that sticks in my mind most, outside of Japan, is Venezuela. I realized this the other day when I read about the passing of Venezuela’s President Hugo Chavez. About three decades ago, an incident happened to me in Venezuela that I never have forgotten. I wrote about the incident, so old-time followers of my column probably remember the story. I took a Japanese professional baseball team to Caracas, the capital of the country, to play a series of games against their national team. Well, the sponsor of the trip filed bankruptcy and we were stranded. Not only that, we were staying in a hotel in Caracas and the sponsor couldn’t pay the bill, so we were tossed out onto the street. Fortunately, the Japanese consul general told us we could stay at his residence until we found a way to pay our way back to the U.S. and then to Japan. A month passed without any hope of getting out of Venezuela. So, I asked the players if they had enough money to buy a one-way plane ticket to Miami, the closest place in the U.S. we could escape to. Well, most of them said they did, so we went to the airport, bought our tickets, and got on the plane. Unfortunately, the hotel where the team owed money was keeping an eye on us and heard about our “escape” and sent a military force to remove us from the flight. So, there we were back at the consulate residency. Well, I put a phone call back to Gardena to see if I could get some help. One of my wealthy friends said he would pay the hotel bill and cabled me the money and I paid the hotel. I promised my friend that when the players returned to Japan they would cable me a check to pay him. And, we “escaped” from Caracas. Which is the reason the mere mention of that country brings back these memories. “Hi. You are receiving this email because you supported the Nozomi Park name change in Chandler, Arizona back in late 2011. “The word ‘Nozomi’ is the Japanese word for ‘hope’ and the park name was inspired by the game of baseball that gave Japanese Americans a sense of hope and normalcy while unjustly incarcerated in camps during World War II. “To commemorate this anniversary, the Nisei Baseball Research Project has partnered with several organizations in the Phoenix area, including the Oakland A’s (spring training), the Gila River Indian Community, the Japanese American Citizens League (JACL), Arizona Chapter, the City of Chandler, Arizona Library and the Chandler Historical Society to offer two events open to the general public. “Attendees of both events will have an opportunity to meet Japanese American baseball pioneers Kenso Zenimura and Tets Fukuhara (and other special guests) and have them sign copies of the book ‘Kenichi Zenimura, Japanese American Baseball Pioneer.’ Books will be available for sale at both events. Putting the event together is Bill Staples, baseball historian and Nisei Baseball Research Project chairman. This should be an interesting and historic event. I know that when we were at Heart Mountain Relocation Center, Kenichi Zenimura brought the Gila team to Wyoming for a series of games with the Heart Mountain all-star team. To this day, I don’t know who and how the Gila team financed the trip from Arizona to Wyoming. But the series really captured the attention of the Heart Mountain internees. As I recall, the series was split with each team winning half of the game played.